Crushes the spermatic cords but does not cut the skin or the arteries to scrotum. Strong, precise action. Excellent for castrating ram lambs up to 90 days of age. Castrating lambs and kid goats. Testicles dry up and scrotum shrinks within 21 days. Crushes the spermatic cords but does not cut the skin or the arteries to scrotum. Thus no blood and less risk of fly-strike. When doing second side, slide the Emasculatome down a little. You do not want the opposing marks to meet. Would not recommend as there are gaps on the sides that allow the cord to escape the clamp. It is difficult to tell if the cord has in fact been crimped fully or escaped. I would recommend the "side" clamp tool instead. It costs more, but is well worth the certainty of knowing whether the cord has been fully crimped. cheap and easy to use.theres just a way in using it. so practice.never experience a problem for lambs and kids that are castrated. cause problems if not used correctly--instead of the scrotum drying up, it swells, ruptures and attracts flies. 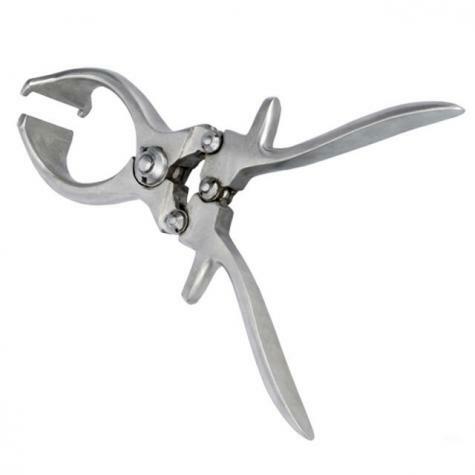 Key is to make sure scrotum still has circulation by never clamping the entire scrotum across with a single clamp and don't allow the clamp marks (one from each side) to meet. Excellent tool. Testicles dry up and scrotum shrinks within 21 days or so. 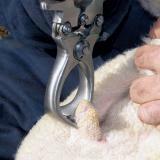 Good method for castrating older lambs. Important that the tool is stored open (not clamped shut) or it may lose adjustment. Needless to say, keep it oiled and in good condition.